flavor with other flavor, originally uploaded by Tashabear. The first "natural flavor" modifies "roasted garlic." It's roasted garlic FLAVOR, there's no actual garlic bits in it. 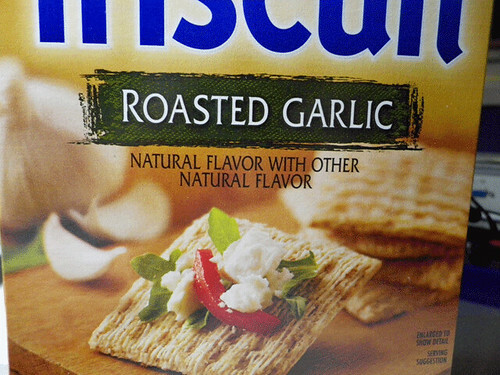 So it's saying "Roasted garlic natural flavor, with another 'natural flavor.'" But honestly what designer let that leave proof? There's garlic powder in it, so I guess that's the first "natural flavor"... but yeah. Whut? Exactly. It should be 'Other Natural Flavors' at least. It means "Made in Malaysia". My flavor haz a flavor! They are! Semantically devoid of informative content, but very tastee. Now if only they'd bring back garlic-flavored Ritz... They'd be SO GOOD on fish.